Home September 15 2017 Vol. 37 No. 16 Feature Articles Supplement: Continuous Bioprocessing: Is It for Everyone? GE Healthcare's ReadyToProcess WAVE 25 single-use bioreactor can be used for batch and perfusion cell culture processes. 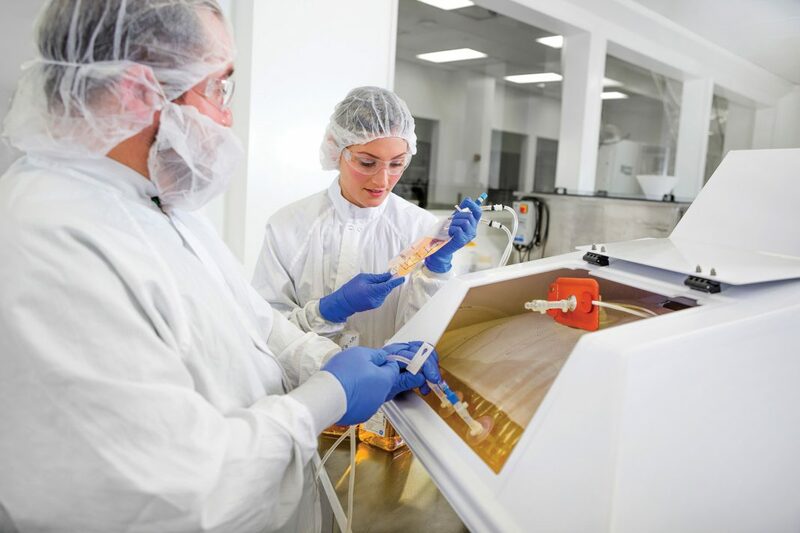 The biopharma industry’s interest in continuous processing is driven by expectations of reducing cost, improving quality, and increasing productivity. For biologics prone to degradation in batch and fed-batch (FB) processes, continuous processing allows capture under stable conditions. There could also potentially be a quality benefit for non-labile molecules such as monoclonal antibodies (mAbs). Glycosylation profiles of mAbs can change in batch or FB systems, likely due to enzymatic modification or degradation after secretion.5 For molecules where the glycosylation profile is critical to safety or efficacy, continuous processing could be advantageous. Downstream, the challenges vary by scale. At clinical scale, substantial focus is directed at reducing chromatography resin cost because the full lifetime of the resin typically cannot be used. Resin lifetime utilization is higher at commercial scale, so the main drivers here are maximizing both facility utilization and production rate. Three scales of a monoclonal antibody process are modeled here, representing the range typically seen in manufacturing. Modeling is based on monclonal antibody titers typical for each upstream mode (5 g/L for fed-batch, and 1.2 g/L for perfusion). Adapted table used with permission from BioPharm Services. CB describes a spectrum of operating modes. A continuous unit operation can be defined as having a continuous flow input for prolonged periods and a minimal internal hold volume. A continuous process can be defined as one where continuous unit operations are physically connected with minimal hold volume between them.5 Processes can be fully continuous end-to-end or partially continuous (called hybrid or semi-continuous). Upstream CB traditionally refers to operating the N-stage production bioreactor running continuously in perfusion mode, frequently in combination with continuous harvesting. Examples of more targeted CB unit operation methods include perfusion to generate high-density cell banks, seed expansion, and N-1 inoculum preparation. Another is concentrated FB, in which the perfusion system concentrates the cells and/or product prior to harvest, avoiding the complexity and risks of continuous operation. Downstream CB often refers to continuous capture. For chromatography-based processes, continuous capture can be accomplished using variations of a technique called periodic counter-current chromatography (PCC) or simulated moving bed (SMB). In PCC, three or more columns are switched between the loading and non-loading steps to maximize resin utilization and minimize buffer requirements. Other options leading towards downstream CB are concurrent buffer preparation (in-line conditioning) and continuous tangential-flow filtration. Risks and benefits are shown in a heat map based on the authors’ continuous bioprocessing experience (bright red: relative higher risk; bright green: greatest benefit). We encourage readers to perform their own assessments and to use the risk-benefit tables in this paper as a general guide. It is important to consider that the benefits could vary between different application areas (for instance, monoclonal antibodies, vaccines, recombinant proteins, and plasma). 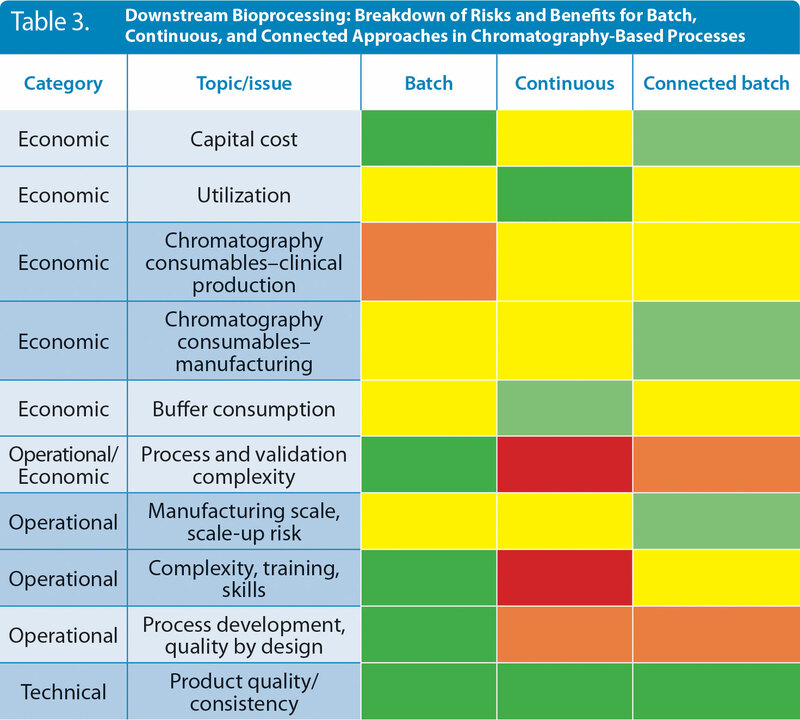 Batch, continuous, and other manufacturing approaches come with different risk-benefit profiles (Table 2). For instance, upstream CB processes offer lower scale-up risk, reduced capital cost, and improved quality of unstable products compared with batch and FB. Potential effect on COGS is highly debated and depends on many variables.4,6 However, these benefits come with risks, including higher cell culture medium consumption and costs, which, coupled with the lack of real time in-line quality and contamination sensors for feedback/feedforward process control, can translate to very expensive excursions and business risk (cumulative QC risk). Other reported risks include difficult-to-process high cell density and titer streams containing high DNA and host-cell protein contaminants.7 There is also greater burden on QbD process development, validation, and training. Similarly, downstream manufacturing approaches have different relative risks and benefits, which require trade-offs (Table 3). For example, continuous processes typically impact resin utilization and consumption favorably, especially in clinical production. 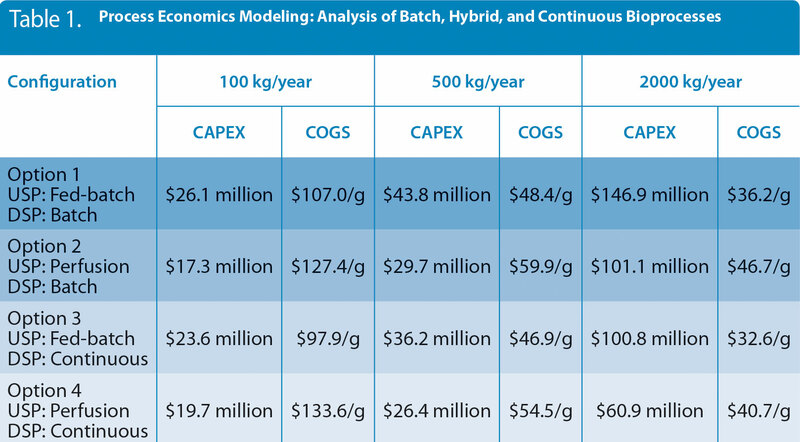 However, impact on capital cost varies when compared with batch processes, because more complex equipment is required. Also, the increased cost of more, although smaller, prepacked columns or additional column packing, will offset some of the savings in resin utilization. 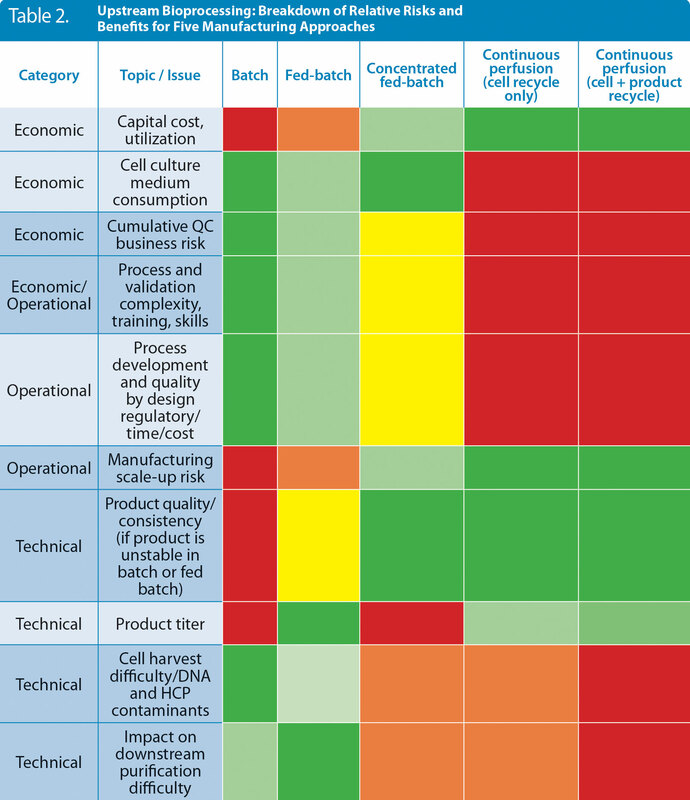 Risks and benefits are shown in a heat map, compiled based on the authors’ continuous bioprocessing experience (bright red: high risk; bright green: greatest benefit). We encourage readers to perform their own assessments and to use the risk-benefit tables in this paper as a general guide. It is important to consider that the benefits could vary between different application areas (for instance, monoclonal antibodies, vaccines, recombinant proteins, and plasma). Targeted continuous unit operations can be achieved with minimal risk, but end-to-end CB faces some implementation challenges. These challenges center around three themes: regulatory, expertise/complexity, and control strategy. Approximately 20 commercially approved biologics use perfusion manufacturing upstream; however, no cases of continuous downstream manufacturing processes have been reported for approved biologics. As such, there remains uncertainty in how regulators will approve a continuous downstream manufacturing strategy. Also, although the FDA has established an Emerging Technology Team to help promote adoption of new technologies, CB experience needs to grow rapidly, and guidance on how to conduct QbD studies for CB are needed. Due to process complexity, developing and running a continuous process requires a highly expert staff who can see trends and avoid potential impending excursions, and transferring to the GMP manufacturing floor requires specialized operator training. Plans to manage failure modes are required to mitigate unplanned production stops and product losses. Also, QbD process development and validation work becomes more complex, because there are significantly more connected unit operations to control and validate. In addition, at the commercial stage, it is critical to ensure a consistent stream of high-quality raw materials are available without interruption. Challenges with control strategy include those related to automation and process analytical technology (PAT). Real-time, in-line sensors and feedback/feedforward control are highly desired, but very limited in availability. This gap combined with the required consumption of large volumes of cell-culture media, buffers, and other raw materials poses a significant business risk to biomanufacturers considering end-to-end continuous processing. Having a control strategy in place with the right automation is imperative to successfully run continuous operations, especially in a GMP commercial manufacturing environment. The benefits of CB outweigh the risks in some situations, but it may not be practical for all bioprocesses. We recommend conducting a needs-based analysis of your process with help from experts in GMP continuous manufacturing. Such an analysis can highlight situations where continuous processing could positively impact product quality, improve process consistency, potentially lower costs, and debottleneck operations. Two widely referenced cases that make sense for CB are when the product is unstable or the cell line is a low producer and productivity needs improvement. Parrish Galliher is chief technology officer, upstream; Guenter Jagschies, Ph.D., serves as strategic customer relations leader, bioprocess; and Amit R. Dua is global marketing strategy leader, bioprocess, GE Healthcare Life Sciences. 1. EvaluatePharma. World Preview 2017, Outlook to 2022. 10th Edition, June 2017. 2. Deloitte, “Advanced Biopharmaceutical Manufacturing: An Evolution Underway,” (2015). 3. BioPlan Associates, 14th Annual Report and Survey of Biopharmaceutical Manufacturing Capacity and Production, (2017). 4. A. Sinclair, “Scale Up vs. Scale Out, What Drives the Decision,” BioPharm Services, presentation at Bioprocess International West (March 2017). 5. K.B. Konstantinov and C.L. Clooney, “White Paper on Continuous Bioprocessing,” (May 20–21, 2014). Continuous Manufacturing Symposium, J. Pharm. Sci. 104, 813–820 (2015). 6. J. Pollock, S.V. Ho, and S.S. Farid, “Fed-Batch and Perfusion Culture Processes: Economic, Environmental, and Operational Feasibility under Uncertainty,” Biotechnol. Bioeng. 110, 206–219 (2013). Bioprocessing,” presentation at the CaSSS meeting (April 21, 2016). 8. GE Healthcare, Application Note, “One-Step Seed Culture Expansion from One Vial of High-Density Cell Bank to 2000 L Production Bioreactor,” 29160932, Edition AB (2016). 9. J. Stout, “Shire’s Manufacturing Strategy and New Flexible Facility: Completely Disposable Upstream and Traditional Stainless Downstream,” presentation from the IBC Life Sciences 7th International Biopharmaceutical Manufacturing and Development Summit (September 12–14, 2011). 10. GE Healthcare, Application Note, “Continuous Chromatography in Downstream Processing of a Monoclonal Antibody,” 29170800 Edition AA (2015).